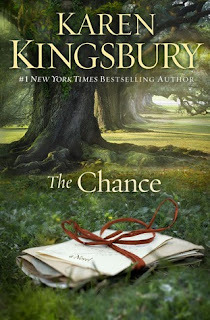 My thoughts: I'm so, so glad there's a stand-alone Karen Kingsbury book that's this.good. I feel like she writes a lot of series and while they're fun to read, they take a lot of time. If you're looking for one really fantastic book to read, this one is for you. It was a little predictable at times, but super easy to devour! Love me. Love me. I'm not what you expected, but oh, please love me. When photographer Kelle Hampton learned she was pregnant with her second child, she and her husband, Brett, were ecstatic. Her pregnancy went smoothly and the ultrasounds showed a beautiful, healthy, high-kicking baby girl. But when her new daughter was placed in her arms in the delivery room, Kelle knew instantly that something was wrong. Nella looked different than her two-year-old sister Lainey had at birth. As she watched friends and family celebrate with champagne toasts and endless photographs, a terrified Kelle was certain that Nella had Down syndrome-a fear her pediatrician soon confirmed. Yet gradually Kelle's fear and pain were vanquished by joy, as she embraced the realization that she had been chosen to experience an extraordinary and special gift. 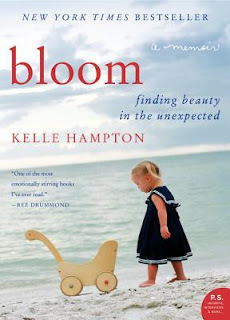 Bloom takes readers on a wondrous journey through Nella's first year of life-a gripping, hilarious, and intensely poignant trip of transformation in which a mother learns that perfection comes in all different shapes. It is a story about embracing life and really living it, of being fearless and accepting difference, of going beyond constricting definitions of beauty, and of the awesome power of perspective. As Hampton writes, "There is us. Our Family. We will embrace this beauty and make something of it. We will hold our precious gift and know that we are lucky." My thoughts: Okay. I liked this book. I read other reviews for this book while reading this book and while I agree with the fact that the author appears to want everything to be perfect, I don't think the author means that in quite the horrible way everyone else seems to think. As a new mom, I can tell you that I absolutely worried about my unborn baby. I knew a perfectly healthy baby wasn't guaranteed (just as tomorrow isn't guaranteed). I prayed for a healthy baby. At the end of the day, that's all I wanted. Even if I died in childbirth, I wanted a healthy baby. Kind of morbid, but I'm a realist and I know in every moment of life, there is risk the next moment on earth won't exist for me. So, I liked the book. The pictures were phenomenal, and I think the author was incredibly honest in sharing her journey from what she expected to what was reality. I think it was brave to share her feelings. The book is, at times, difficult to read because I kind of wanted to shake her and tell her, your baby is FINE! Get over it. But I know any sort of condition is difficult over the course of a lifetime, so I totally could empathize. Anyway, I recommend the book. Jeremiah Williams has been tending the gardens of the Tennessee governor's mansion for over twenty-five years. And like most first families who have come and gone, this one has stolen his heart. Mackenzie and her husband, Governor Gray London, have struggled for ten years to have a child and are now enjoying a sweet season of life--anticipating the coming reelection and sending their precious daughter, Maddie, off to kindergarten--when a tragedy tears their world apart. As the entire state mourns, Mackenzie falls into a grief that threatens to swallow her whole. Though his heart is also broken, Jeremiah realizes that his gift of gardening is about far more than pulling weeds and planting flowers. It's about tending hearts as well. As he uses the tools that have been placed in his hands, he gently begins to cultivate the hard soil of Mackenzie's heart, hoping to help her realize what it took him years to discover. 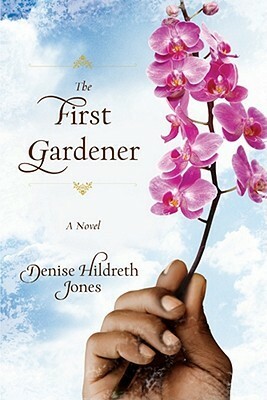 A Southern tale of loss, love, and living, "The First Gardener" reminds us that all of life is a gift, but our heart is the most valuable gift of all. My thoughts: This book was one of my favorites I've read this year. It was heartbreaking, so heartbreaking. It had a bittersweet ending. It was just a really unique, interesting book. I can't even put it into words! The only negative for me with this book was Mack's mother and her mother's friends. They were just annoying. For me, they really took away from the book. But other than that, I loved it. his snacks in this all-new collection of hilarious daily and Sunday comics. On with the show! 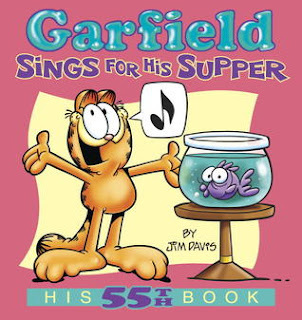 Additional notes: This is the fifty-fifth Garfield book, plus there are tons of other Garfield books. Search "Garfield" in the search bar of this blog to read my reviews of the other books. My thoughts: This book was particularly funny, even more so than the other Garfield books. Some of the memorable strips that come to mind are the Sudoku-themed strips and the strips with the fish bowl. Jason and I both laughed our butts off at this book and agreed it was one of the funnier ones (even though they're all funny! ).